There’s a scene in Edith Wharton’s 1913 novel Custom of the Country, where the wicked vixen Undine Spragg insists on speeding across the High Bridge in a “horseless carriage” before making her grand entrance at a party so as to rouge her cheeks with a cold snap of air whipping up from the Harlem River. 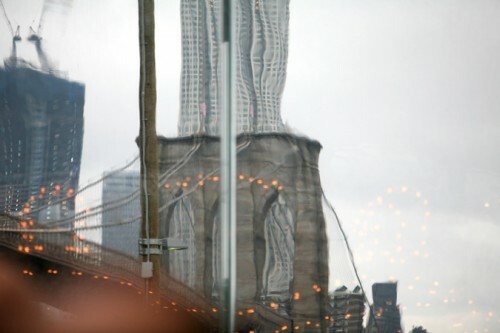 The romantic fascination accorded the then-65-year-old bridge quietly slipped from New York’s consciousness as bigger engineering marvels usurped its quiet dignity. 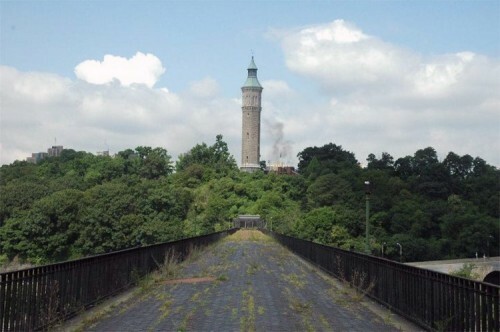 Now approaching 165 years, renovations are about to get underway to finally restore the bridge to its former glory as a 1,200-foot-long pedestrian bridge, uniting neighborhoods of High Bridge and Washington Heights in the Bronx and Manhattan. New Yorkers for Parks stopped by the span Monday afternoon to document current conditions before construction is in full swing, giving us a hint of Undine's views. 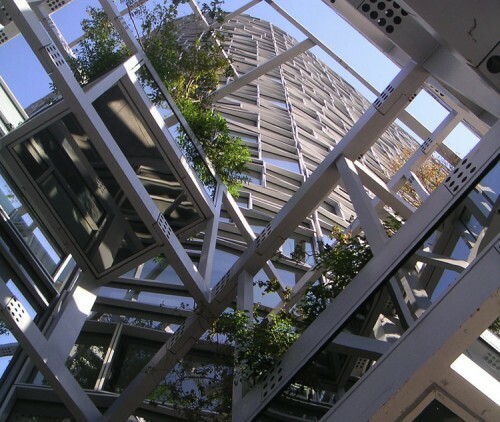 Though controversial netting integrated into the design might mildly disrupt the vista, Monday’s photos show it the way it was, albeit slightly overgrown. The U.S.S. Intrepid looks visibly pregnant, and it seems as though she still hopes to give birth to an offshoot of the museum in a parking lot directly across the street. 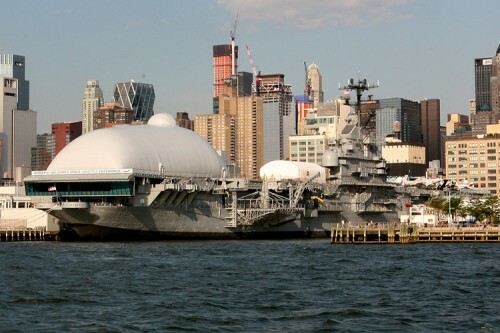 About nine months ago, New York's Intrepid Sea, Air and Space Museum revealed that it had its eye on a prime parcel owned by New York State adjacent to the museum on 12th Avenue to house its newest attraction, the Space Shuttle Enterprise. Most of the recent attention on the shuttle has focused on the herculean effort to get it onto the deck, where it rests in a temporary pavilion that sits on the bow looking like a bulbous balloon about to burst. A spokesperson for City Planning said that the city's zoning laws extend out to piers but requirements for permanently docked structures are a bit nebulous. In an interview, museum president Susan Marenoff-Zausner said that the goal remains to get the Shuttle onto dry land. She was quick to note that the renderings on display in the temporary pavilion were merely a concept for the new building, not a final design. The display is part of a fund raising effort for the new complex called “Sponsor a Star.” The master plan calls for a permanent home with all of the amenities required of a cultural institution today, including classrooms, an auditorium, retail, and a café. 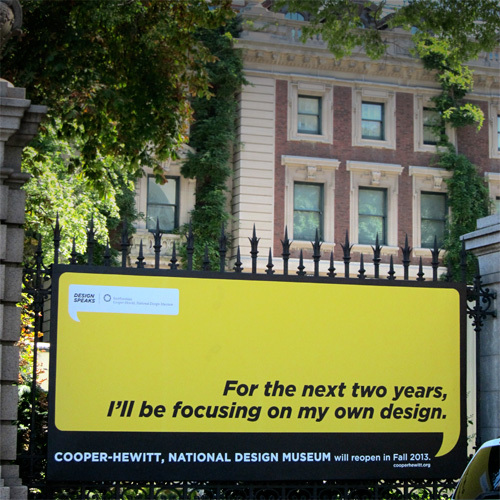 It would also become the entry point to process the expected one million visitors each year. 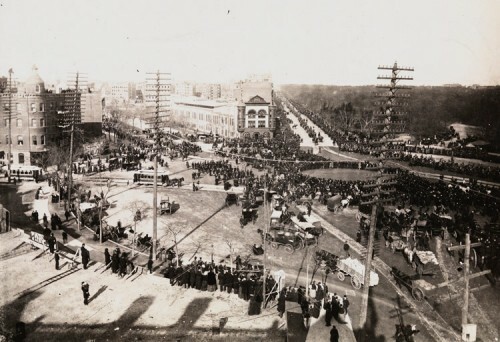 The lot is already connected to the museum by a pedestrian bridge that spans 12th Avenue. 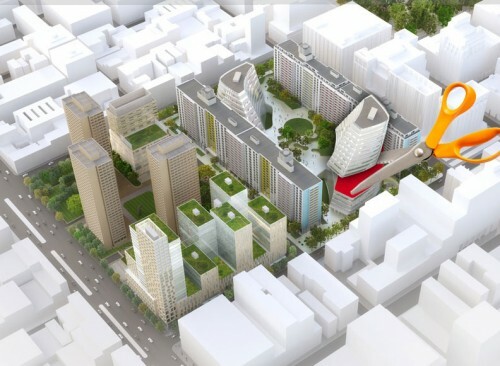 Marenoff-Zausner said that Jones Lang Lasalle, a real estate services company, is conducting a feasibility study based in part on the interest generated by the new star attraction over the next year. Asked about about the project's feasibility, the museum president said, “The State has been wonderful." It's a bird! It's a plane! No, it's actually a plane. 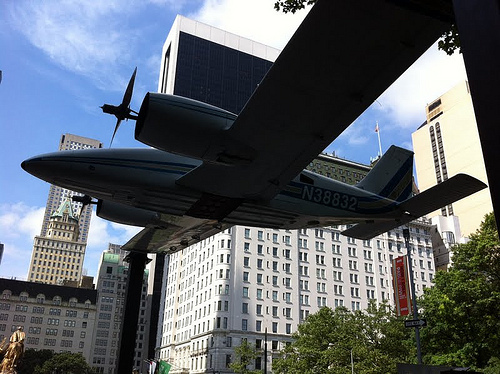 On the corner of 60th Street and 5th Avenue in Manhattan, a six-seat, twin-engine Piper Seneca aircraft balances on two vertical steel posts positioned at the end of its wings, playfully rotating on its own axis and likely confusing visitors to Central Park. After doing a double take on the surreal scene, find a plaque located nearby and you'll learn that this mysterious aircraft is actually an installation by artist Paola Pivi, whose portfolio includes scenes of zebras on snowy mountaintops and arenas of screaming people. Working with the Public Art Fund, an organization dedicated to present artists’ work throughout New York City, Paola Pivi opened her newest installation featuring the Piper Seneca, How I Roll last Wednesday, June 20th. Like much of Paola Pivi's work, How I Roll challenges the onlookers to broaden their imagination and perceive something that's usually inconceivable in reality. Frozen in a continuous loop-the-loop at ground level, the aircraft dismisses its own identity as a flying machine, floating and spinning effortlessly on the edge of the park. By ignoring its own gargantuan weight and the context of flying high in the sky, plane becomes an object, a sculpture, perhaps finally linking industrial design and sculpture. Just take a look at it spinning in the video above, or, even better, get your own in-person dose of surrealism by visiting Pivi's How I Roll any time day or night through August 26th. The PoMo aficionados were out in force at yesterday’s Landmarks Preservation hearing for the new proposal for South Street Seaport’s Pier 17. It would seem that just as debate on the value of 1970s Brutalism shifts into high gear, the 1980s PoMo crowd is revving its engines. 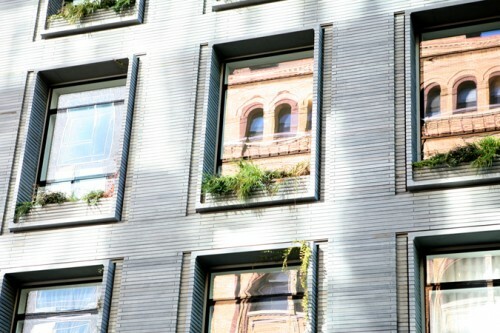 As preservationists and developers whacked it out, some larger questions about context and neighborhood integration arose. 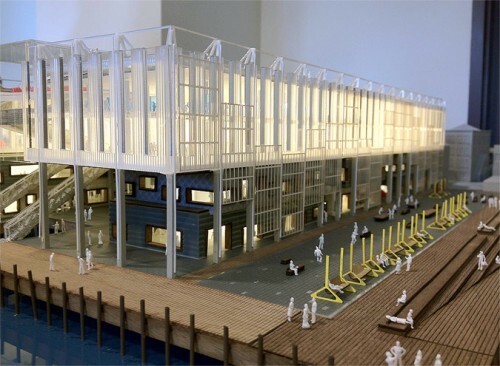 The SHoP-designed tectonic glass response to Ben Thompson’s wood-clad gables of the exiting 1985 Pier 17 building is a clear break from the past, both literally and figuratively. SHoP’s Gregg Pasquarelli didn’t mince words when he told the New York Times “We’re taking away the po-mo and making it a real waterfront market building.” But Thompson, who died in 2002, had plenty of defenders on hand yesterday, including a statement from his wife Jane Thompson, who warned that real estate in the new plan “will inevitably rise to premium rates; privatization will intensify, which forces a turn to luxury retail.” Elise Quasebarth, of the preservation consultancy group Higgins Quasebarth, testified on behalf of Howard Hughes Corporation, the developer, that many of the upland elements planned in conjunction with the 1980s "festival marketplace" are still fundamentally robust. 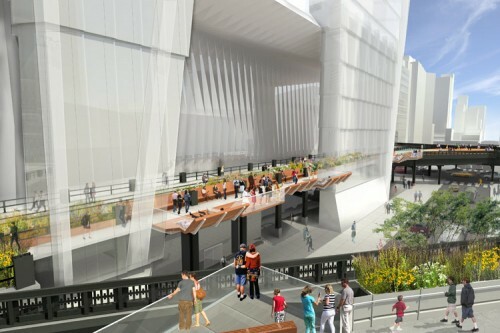 The SHoP worked with James Corner Field Operations to further integrate the street grid through a north-south connection to the East River Waterfront Esplanade and east-west connections to Beekman and Fulton streets. But the deal between NYC Economic Development Corporation and Howard Hughes has a distinct cutoff point at the so-called Tin Building. The empty 1907 structure, which formerly housed a market, sits at the river’s edge where the pier juts into the river. Though the plan has the support of Community Board 1, the board did encourage a master plan that carries through the entire South Street Seaport Historic District. Further complicating matters, the district actually cuts through half of Pier 17. The board resolved the districting by extending the boundary to incorporate the north section of the pier as well. The concern was driven home by local wine merchant Marco Pasanella who testified that the uplands should be considered as part and parcel pier plan and that only a “holistic” approach would work, particularly while the pier is under construction. Pasanella said the big picture should ensure that the plan attract similar tenants and “the right sort of visitors." Speaking on behalf of the Howard Hugh’s Corporation, senior executive vice president Chris Curry said the taking the nearby elements into account, particularly the Tin Building, would require a separate ULURP. He added that the company wants to make an immediate investment, though that wouldn't preclude additional investments down the line. For the time being however, the cutoff point leaves a few of Thompson’s gables left at the back of the pier. Pasquarelli said they would be painted a uniform color to visually drop away. The gables would still function as a mask for mechanical equipment. If all goes as planned, a little slice of PoMo might survive after all. News Paper Spires The Skyscraper Museum 39 Battery Pl. Through July 2012 Focusing on the years between 1870 and 1930, News Paper Spires at the Skyscraper Museum considers the buildings where the most important events of the day were committed to the public record with ever-increasing speed. 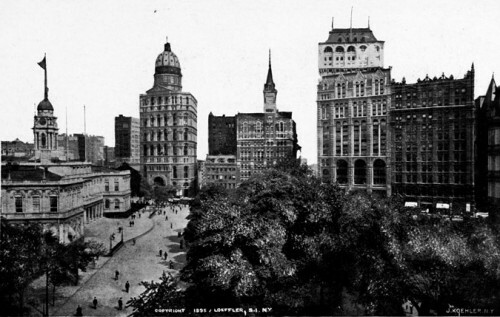 Just after the Civil War, The New York Times, The New-York Tribune, and The New York Post all were headquartered on the so-called “Newspaper Row” to the east of City Hall Park (above), each headquartered in early skyscrapers, where writers and editors worked above, while below typesetters and steam-engine powered printing presses churned out morning, afternoon and evening editions. In this exhibition, the history of these vertical urban factories—including their migration from downtown to midtown—is considered through films, architectural renderings, photographs, typesetting equipment, and the archival newspapers themselves. The Greatest Grid: The Master Plan of Manhattan, 1811–2011 Museum of the City of New York 1220 Fifth Avenue Through April 6, 2012 In 1807, to head off health threats and a growing lack of habitable space, New York City’s Common Council commissioned a three-year project to organize massive land development north of Houston Street. The Museum of the City of New York presents The Greatest Grid: The Master Plan of Manhattan, 1811–2011 in honor of the bicentennial of the 1811 Commissioners’ Plan for New York, which established the iconic street grid from Houston to 155th Street. Along with the original, hand-drawn map of New York’s grid plan, other historic documents demonstrate the city’s physical development due to the grid’s application and evolution over time. Co-presented by the Museum of the City of New York, the New York Public Library, and The Architectural League of New York, and sponsored by the Office of the Manhattan Borough President, The Greatest Grid will be on display until April 6. Click on a thumbnail to launch the slideshow.